As part of the continuation of the Honest Lunch series with Honest Food, I decided to dip my toe into the wonders of Manchester lunching. If you're looking for the perfect ethically produced and sourced lunch spots, this is the article for you! In every bustling UK city, comes the rise in restaurants and cafes offering delicious, on-the-go lunch options to curb mid-day hunger. 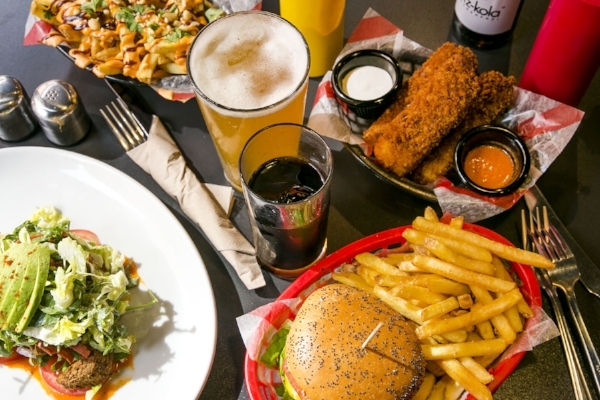 The growth of Manchester's city centre has welcomed a number of choices for sustainable, ethical and tasty food outlets on the high street. This goes hand-in- hand with the city's steps towards becoming green. But with such a variety available, where do you start? Check out our top 5 outlets in Manchester that hold strong moral stances, source locally and deliver the most indulgent food, all with a healthy conscious. Inspired by flavours around the world, Bristol brand Friska has opened its doors in the heart of Manchester, delivering feel good food for both breakfast and lunch. While you’re there, be sure to pick up a coffee, where the beans are sourced directly from farms that the co-founders know and trust. Each barista is trained to craft your favourite brew with top-notch skills and passion. In 2009, Friska was born from two friends Ed and Griff who met in their mid-20s through their love of good food, great coffee and a belief that business could and should be a force for positive change in the world. Together, they’ve built up their brand, from its roots in Bristol, growing to create a culture where they are proud of what they produce and how they produce it. They pride themselves in offering tasty lunch options for vegetarian, vegan, gluten free and dairy free diets, from salads to sushi, to flavour-packed sandwiches and hotboxes. Aside from offering delicious and sustainable food, the brand have partnered with two charities to ensure they do business the responsible way, and have a positive impact on the world. Friska fund Deki entrepreneurs through the sale of the Deki Dish on their menu. These are Pho noodles. All of their branches take part, so whether you're in Manchester or Bristol, you can pop in and a grab a bowl. A portion of what you pay goes towards the charity, who lend money to hard-working entrepreneurs in Malawi, Ghana and South Sudan to start their own businesses and work their way out of poverty. To date, Friska have been able to fund 302 entrepreneurs, with the number growing all the time. FRANK Water have been partnered with Friska since 2016, in which they donate money to the charity with every bottle of water purchased in-store. So far, they have donated enough to build a clean drinking water facility to support a whole village in rural India. 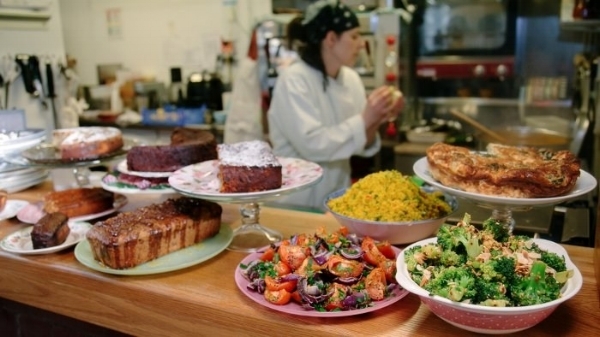 Pop down to the Earth Cafe to visit one of Manchester's first vegetarian cafes and juice bars. It prides itself on producing natural, seasonal and home-made food with an ever-changing menu. This is because they ethically source all their food, including using organic produce at every possible opportunity. Meals are based on what's available at the market that day, so you can be assured that everything is freshly made. Awarded a Gold Food Futures certificate for serving healthy and sustainable food, Earth Cafe offer a mix of classic dishes with a unique twist and original recipes crafted by their in-house chefs. If only fancy a little snack, then these guys have got you covered with their juice bar that also serves organic teas, coffees and dairy-free cake. You may have seen these guys at your local foodie festival – as they jump at the chance to pop-up at festivals, exhibitions and specialist vegetarian events. However, they do have a cafe that you can visit for a lunchtime treat. Considered a hidden gem, their cafe is nestled in the basement of the Buddhist centre in the Northern Quarter. While Earth Cafe does offer some vegan options, V-Rev prides itself on being Manchester's only entirely vegan restaurant. Born in 2011, this place is set up as an Instagrammable dinner – think bold block colours, indulgent food served in baskets and ketchup bottle decorations. Whilst these guys are relatively new to the scene, they are already notorious for their meat-free fast food dishes such as burgers, hot dogs and mac 'n' cheese. Based in the Northern Quarter of the city, V-Rev do a lot of work behind the scenes to reduce their carbon footprint and recycle all waste. This includes steering clear of any products that have been tested on animals, or contain a substance produced by an animal. 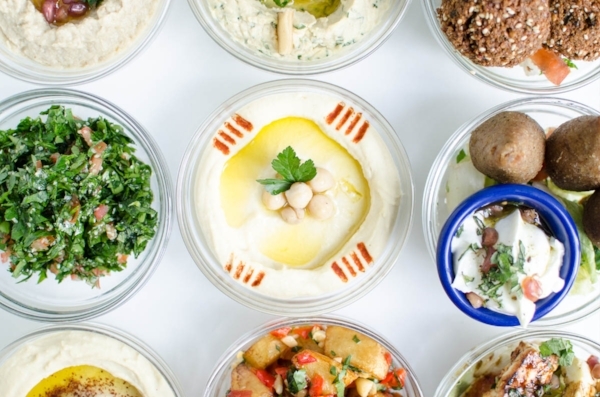 While they may have started in Liverpool, Bakchich have been open in Manchester since 2015, inviting local residents to discover the wonders of sustainable, Lebanese street food. Coming from humble beginnings, the brand started out on the Christmas Markets of Liverpool. With their fresh ingredients, new and unique flavours, their small and traditional menu was a major hit. This drove them to grow into the multi-restaurant business we see today. With recipes passed down through the generations, Bakchich offer a French twist on all food, serving a variety of homemade Mezza plus traditional Lebanese dishes from Shawarma to falafel and Baklawa, all which can be washed down by a variety of organic fruit cocktails. Get ready to step into a new world as you enter this restaurant for a spot of lunch – from the tiles on the floor that were sourced from their Grandpa's house in Marrakesh, through to the Cedar Wood decorations surrounding the windows, every single detail feels as if you have jetsetted to a local Lebanese restaurant. While it may feel that this is similar to most other restaurants, these guys are committed to building a loving and accepting community in the heart of Manchester. They open their doors to people of different backgrounds and beliefs and bring them all together – celebrating the healthy, sustainable food the founder grew up loving in Beirut, whilst giving back to the local community and promoting organic food and healthy food choices. The Real Junk Food cafe is a must-visit for a lunchtime treat which actively helps reduce food waste. 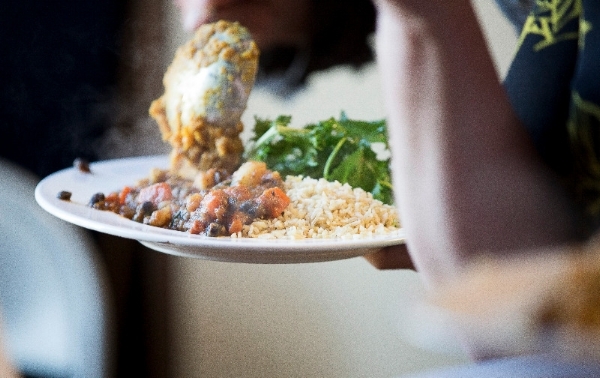 Whilst there is only one in Manchester, The Real Junk Food movement are a group of cafes across the country, using discarded food from supermarkets, restaurants and local stores that would otherwise go to waste and creating delicious meals. With a focus on health and nutrition, they serve food to anyone and everyone on a pay-as-you-feel basis. Working directly with the council, The Real Junk Food Project perfectly aligns with Manchester's zero waste strategy. You can find Manchester's zero-waste cafe on Oxford Street, where they offer both table service on the ground floor and a takeaway menu. If you fancy some fine-dining, be sure to head back in the evening for supper clubs and guest chef takeovers. Since its launch in 2013, 44,723 people have visited the café, saving 1,167,605kgs of food waste which would have otherwise ended up in landfill.